audience -- practicing educators. Key Features Includes numerous concrete examples on important topics such as data collection instruments and presentations of research results Integrates two detailed and practically-based action research case studies throughout the book Provides sections within each chapter with related Web sites, highlighted concepts, summaries, questions and activities, glossary, and a sample syllabusnbsp; nbsp; The practical and applied approach of Action Research: Teachers as Researchers in the Classroom will benefit students enrolled in graduate courses in Action Research, Research Methods in Education, Qualitative Research Methods, Principalship, and Superintendency. monographs, and technical papers. These include the books Canadian Cases in Human Resource Management, and Cases in Organizational Behaviour and the articles Driving Loyalty Through Time-to-Value, and Managing the New Product Development Process: Best-in-Class Principles and Leading Practices. His current research and consulting activity focuses on organizational change and the development of high performance enterprises.C raig A. Mertler is currently a Professor and Dean of the Ross College of Education at Lynn University in Boca Raton, FL.nbsp; He has been an educator for 28 years, 18 of those in higher education.nbsp; He teaches doctoral and undergraduate courses focused on the application of action research to promote educator empowerment, school improvement, and job-embedded professional development, and also teaches quantitative research methods, introductory statistical analysis, multivariate statistical analysis, and educational assessment methods. He is the author of 15 books, four invited book chapters, 17 refereed journal articles, two instructors' manuals, and numerous nonrefereed articles and manuscripts. He has also presented more than 35 research papers at professional meetings around the country, as well as internationally. He conducts workshops for in-service educational professionals (at all levels) on classroom-based action research and on the broad topic of classroom assessment. His primary research and consulting interests include classroom-based action research, data-driven educational decision making, professional learning communities, and classroom teachers' assessment literacy. Before teaching and researching at the university level, he taught high school biology and earth science, and also coached track and volleyball. In his leisure time, he enjoys traveling with his family and playing golf. 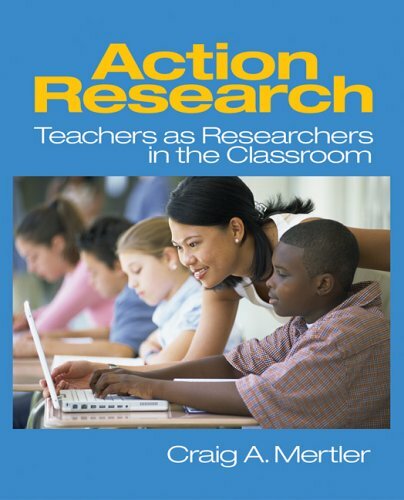 Sample Action Research Report: What Patterns of Teacher-Student Verbal Communication Exist in My Classroom?